AZRiver.com is a web hosting company located near the banks of the Colorado River in Mohave Valley, Arizona. Since 1995, the IT professionals at AZRiver.com have been providing domain name registration services and state-of-the-art Linux/Apache web hosting for the entire globe. We have clients in Russia, Canada, Israel, Mexico and all over the United States. And while we're not as big as the web hosting companies you see on TV, we are just as good as them when it comes to registering and managing domain names and providing secure, reliable email and web hosting for our clients web sites. And we are even better at providing tech support. You don't have to wade through a call center in India or Pakistan to get help. We are right here in Arizona and there are only four people in the whole company and they all speak fluent English! You will almost certainly be dealing with the same person every time too. It's not rocket science, but the founders of AZRiver.com, Tim Umphress and Vic Szilard have both been in the computer and internet industry's since the mid 1980's, before there even was an internet...that's about 50 years worth of real-world experience. While our offices are located in Mohave Valley, AZ, our servers are not. Unfortunately, this part of Arizona - as nice as it is - doesn't have the facilities we need to provide the kind of top-notch web hosting our customers demand. So we have located our servers in a NOC (Network Operations Center) in Charlotte, NC. 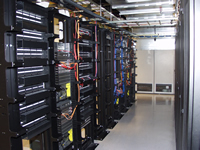 The DC74 Charlotte NOC (also called a "Data Center") has an excellent reputation of reliability, high uptime and redundant capacity. The DC74 Data Center features three buildings. Each facility operates independently with individual transformer power feeds and generators. Each facility is connected by a private underground fiber mesh network, which benefits operations in a variety of ways. Current total space measures approximately 68,000 sq ft with 4MW of power. DC74 is built upon the foundation of space, power and bandwidth. With plenty of rack space, room to grow, multiple fiber network connections and reliable power with redundancy at every level your web site will be safe and available 24/7! We do not overload our servers. When the number of domains we host reaches a pre-determined number, we will add another server. Currently our servers are operating at about 8% of available CPU cycles and available bandwidth. AZRiver.com servers are not just "top-of-the-line". Our NOC techs are constantly upgrading to the latest specifications. We pay careful attention to daily loads, the security logs, and bandwidth usage. Our security experts constantly upgrade the Operating System and other software on our servers to stay on top of the never ending "exploits" that hackers commonly find. 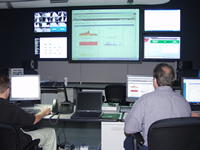 We make use of the latest and greatest hardware and software based firewall and intrusion detection systems. The key to competition in the web hosting industry is to become known for going the extra mile. Rest assured, only the best hardware, software, Internet knowledge and unsurpassed customer support is right here at AZRiver.com!